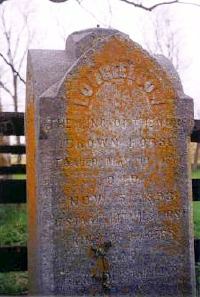 Nantura Stock Farm: Left, Ten Broeck -- earliest marked grave in Kentucky; Right, Longfellow. 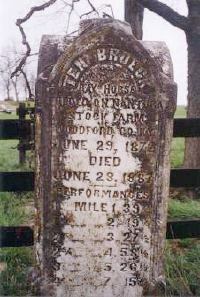 The Harper family's NANTURA STOCK FARM, at Spring Station, Kentucky near Midway, was named for John Harper's foundation mare Nantura. It became home to several outstanding thoroughbreds of the late 1800s. LEXINGTON stood here for his first few years as a stallion before being transferred to neighboring Woodburn Stud. *GLENCOE stood here before being moved to A. Keene Richard's Blue Grass Park at Georgetown. Here also were bred the racing greats LONGFELLOW and TEN BROECK. When Frank Harper raised these stone obelisks over the graves of his heroic champions, first for TEN BROECK in 1887, then for LONGFELLOW in 1893, they became the first stone memorials to mark an equine grave in the state of Kentucky. -- A.P.